Last night Mick popped out to check the ropes before we went to bed, as we were on a river he was actually checking the ropes! Someone from one of the cruisers on the pontoon asked if we had a good torch as someone had gone missing off one of the boats. Mick got our big torch and went out to see what was happening. From inside Oleanna I could see flashing blue lights outside the pub, the gate onto the pontoons was constantly opening and closing. Blimey I thought, had someone gone in! I went out to see if I could help also, but then realised I hadn’t got a torch and couldn’t see the edge of Oleanna to step off. 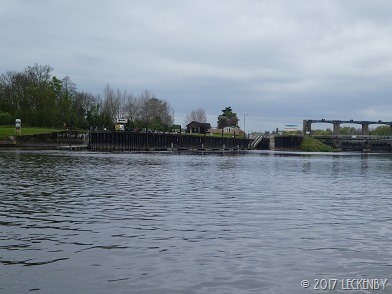 There was a group of people at the other end of the pontoons, a policeman stood talking into his radio and firemen walking in the direction of the lock. Large beams of light swept across the river. A lady on one of the cruisers hadn’t been able to find her daughter, she was rather pissed and was getting in a panic. Other people had suggested checking through the boat again, but the lady was certain that her daughter had fallen in and been swept away by the current. Mick soon returned, the daughter had been found, on the toilet, on the boat. At least she was safe and dry! This morning we took even longer to get going so had a bit of cooked breakfast. Strange noises were coming from outside, it sounded like a dog seriously out of breath. So we opened up the hatch to look. 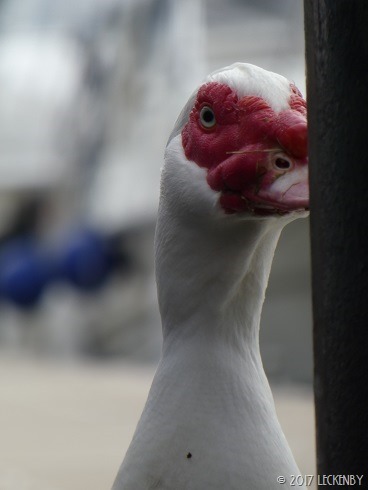 There on the pontoon stood a Muscovy Duck bobbing, dancing and wheezing away looking at his reflection in the side of Oleanna. Either he’d taken a fancy to our new boat or he’d taken a fancy to the rather attractive bird that was dancing along with him. He carried on for quite sometime. We eventually moved off and carried on towards Nottingham. Everyone seemed to be heading in the opposite direction, the breasted up narrowboats and several cruisers had left before us all heading to Newark. On the next reach of the river we passed Burton Joyce, this is where I came from! Plenty of trees were in blossom through the village and up the hill. 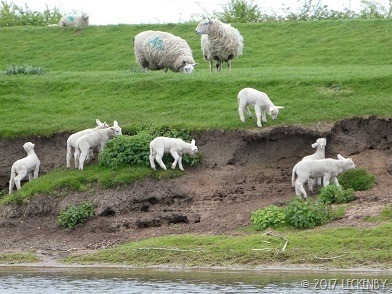 The low banks of the river here are very pretty, a gang of lambs were jumping on and off the grassy banks down onto the little beeches. Stoke Lock soon came into view. 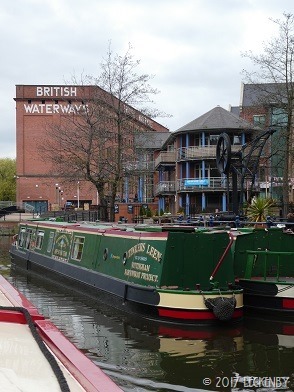 We stopped here for a night a couple of years ago and had a lovely walk around the lock. It has a character all to itself. 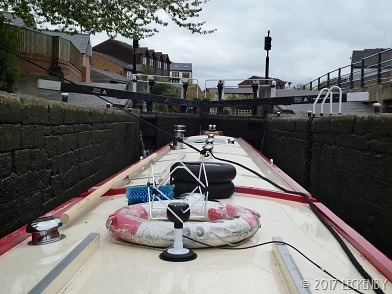 Instead of the horrible blue risers on the lock walls it has large wooden pillars with metal rails attached for your ropes. It is surrounded by woodland with a large variety of trees. This and Hazelford Lock are our favourites. 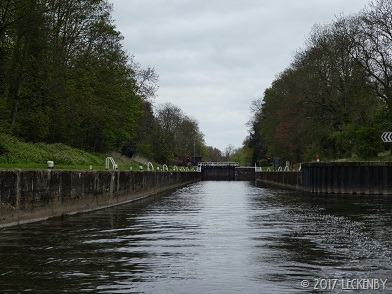 A short distance on and we approached Holme Lock. 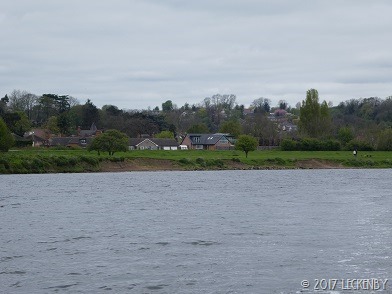 Here the large weir stretches across the river, it has sluices so that the level of water can be controlled in Nottingham quite easily should the river rise. This lock is deep and we seemed to stand holding onto our ropes for hours as it was gradually filled. The hydroelectric station seems to have been completed as there is now no sign of a building sight. 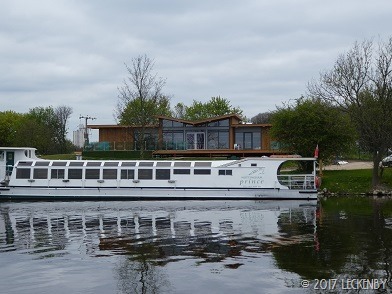 But the island is still waiting to be landscaped and the permanent moorings return to that side of the cut. Above the lock there is a sailing club and there has always been either sailing or rowing going on along the next reach. But today no-one was out on the water. The trip boats have a new home a bit further out of town with a new building to keep them company. Their old home always looked down at heal, now it looks even worse as all the windows have been smashed. As we rounded the last bend before Meadow Lock, Trent Bridge came into view and I could hear chanting. A large group of was crossing the bridge heading to Notts County Football Club. A single hander was coming down the lock , Mick helped and let the chap get back on his boat. We were now on our own again, no lock keepers from here until Foxton or Sawley depending on which way we go. Chanting followed us all the way up to the sharp left turn. Crowds were making their way to the ground from all over. Two chaps started pointing at us and chanting. At first we couldn’t make out what it was, but then we realised that it was “Rosie and Jim, Rosie and Jim”. As we approached the left turn a boat shot across in front of us at quite a speed, did they know to turn towards us? They were winding and kindly let us turn the bend first, just as another boat was coming towards us. 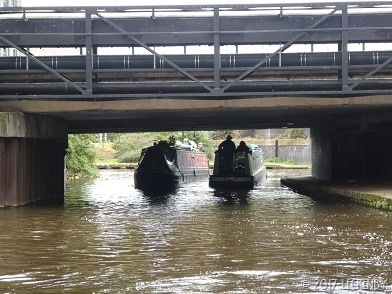 Gosh an almost traffic jam on the Nottingham and Beeston Canal. 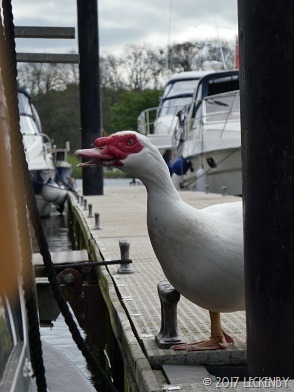 The second boat also winded and they both waited for us to go up Castle Lock on our own so that they could share. The moorings by Sainsburys were quite full, but we found a space long enough for Oleanna. I really need to pace out how long she is for future occasions so we know if she’ll fit into tight spots. This afternoon has been spent in Sainsburys, filling a shopping trolley to almost overflowing and then wheeling it back to the boat. A chicken has been jointed some of which has been frozen for later. Tomorrow we’ll have to return to stock up on wine boxes, they wouldn’t fit in the trolley today! 4 locks, 11.37 miles, 1 right, 2 fire engines, 1 police car, 1 teenager on the loo, 1 amorous duck, 1 lady in dark glasses, 0 sharing, 2 day boats, 5000 Portsmouth fans, 0 Rosie and Jims on board Oleanna! 6 ducklings, 1 large shopping trolley, 1 lonely Tilly look alike boat cat, 1 pack citonella candles. This entry was posted in Uncategorized on 17th Apr 2017 by pipandmick. you're so shiny the duck could see his/her reflection? That's very shiny indeed. Thanks Heather. Oleanna is already in need of a good wash, she actually needed one before we left Sheffield as the boat yard was so dusty, but we've been too busy using her. May give the windows a wash this morning before we set off as they are dirty! The rest will have to wait. Are we going to get more ducks admiring themselves once she's clean again?